The three gentlemen standing on the cotton bales are most likely Shelby Rees Lee, my grandfather, Robert E Lee and perhaps their brother James Lee III. The SADIE LEE is to their right and the HARRY LEE is in front of the SADIE. The colorized postcard below is almost identical to the above picture and it appears that several of the Rousters are in both pictures. These pictures most likely were taken sometime shortly after 1901 when my grandfather began working for the Lee Line. The Lee Line did not go farther south than Vicksburg Mississippi which makes me suspicious that these pictures were not taken at New Orleans. Additionally steamboats landed upriver since controlled landings were easier going upriver than down bound. Memphis is on the east bank of the Mississippi as well as prevailing winds from the south west make me think this picture would have been taken at Vicksburg or Memphis since these steamers are landed starboard side and their smoke is blowing left to right. 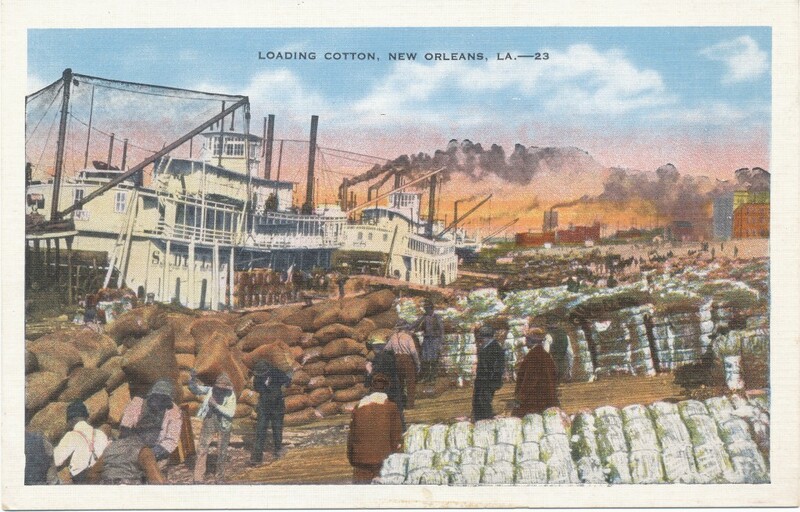 The reverse of this postcard has the following description: “Loading cotton: Husky, singing Negroes handle these great bales of cotton as most people would handle bed pillows. On the great Mississippi river, packets and barges are piled high with the billowy white cotton, tightly encased in burlap wrappings.” There are no pictures showing rousters carrying cotton bales as if they were pillows. The Rousters pictured are carrying what appears to be perhaps 100 pound bags of cotton seed. Pictures of Rousters handling cotton bales show 2 or 3 men rolling bales of cotton across cobble stones or up the gang plank of steamboats. 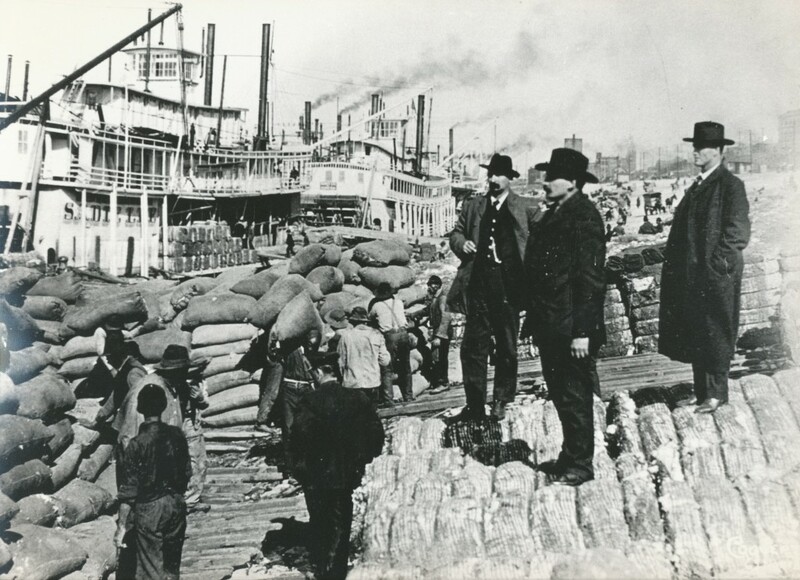 Stacking cotton bales on the decks of steamers would have required 3 or 4 men to lift and position 500 pound bales of cotton. Captain Maikell 83 years old was born near New Orleans Lousiana and had spent almost 60 years “on the river” . He had been wharfmaster for theLee Line at Memphis after the steamer Valley Queen of which he was master, was withdrawn. founder of FedEx worked for the Lee Line as a boat captain during the Mark Twain Era. Again, thank you for sharing this information about your great grandfather. Thank you Jim for your reply…here is a little more information from articles printed in Newspapers about my great grandfather…looks like he also did some work in Texas. I would so love to hear from any one who had more information on him. Strikes Snag in Red River and Goes to Bottom. The Stern Wheel boat Barlow, Capt. William Maikell,struck a snag in Red River six miles above Shreveport this morning and sunk in seven feet of water. She carried a full cargo of provisions for plantations along the Upper Red River. Her Crew of five men are said to have escaped. The accident occurred opposite Colquitts Landing which can not be reached by telegraph or telephone. No particulars are obtainable. Port Arthur, Texas, Dec. 18-The Iceland shell company’s barge “Cyclone “ was righted las Saturday by Captain Maikell a professional wrecker from New Orleans and was taken to Orange and pumped out. She will be again put in commission in the san J and shell bussinesss. Captain Maikell was working for the underwriters who would not make public the cost of the job. Some things can be arrived at by analysis and comparison and the righting of the Cyclone is one of them. The Texas Dredging company’s barge “H Deuteer” which turned turtiv in the lower Neches isa year ago cost $2, 250 go put upon its feet. These figures appear to be out of all proportion to a job like that, but they are correc. In the final attempt which succeeded to right the “Deuteer” four of the heaviest sea going tugs inthese waters were employed at once. These tugs were the “Captian “ the della, “ the Russell and the “Viva.” The last named tug was owned by the steering company. The others were hired. The service of sea- gong tugh is worth about one hundred dollars a day. While the Deuteer” was turned over in about three hours, when the four tugs goat a grip on the craft, yet a month had been spent before the numerouse and vain attempts to get the vessel on its feet. This was what made the cost run up to over $2,000 about one –half of the orginal cost of the barge. The job on the “ Cyclone” was done much cheaper for fewer….at taking her had been maked. But that it was an under writer’s job, and that a professionalman had to be accured from New Orleans. Indivuals indicates that the expense was heavy. In a swift current the….. would have been praticullary ……(a little more to this article but light and difficult to read) They were sucessful. Hazel and Henry W.. Visitors allowed aboard from 10 a.m. to 5 p.m.